'Not to Occupy only state power, our struggle is to eradicate the rule of all kinds of authoritarianism'! 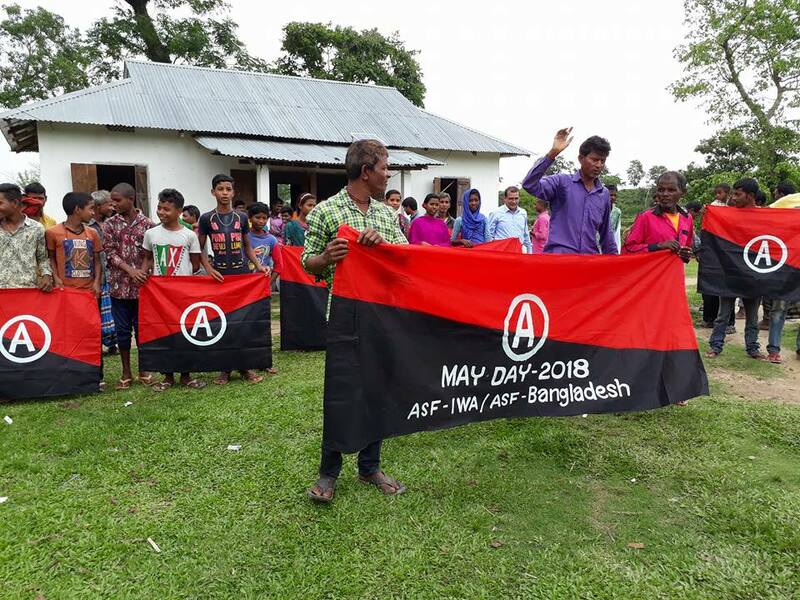 Bangladesh Anero-Syndicalist Federation (BASF) organized a discussion meeting and a rally at 10.am of this morning and with the participation of other affiliated organizations, the meeting of the great May Day and the rally was held in Sylhet, Kewachora tea garden. In this event, a large number of working women, men and youths, took part with enthusiasm. Comrade Moni Sankar Das, Comrade Ranjit Das, Comrade Jugal Das, Comrade Srikant Das, Comrade Amulya Das, Comrade Ananda Das, Comrade Anjan Das, Comrade Sanjeev Karmi, Comrade Nishi Das, Comrade Janoni Das, Comrade Bobby Das, Comrade Shunita Das, and spoke in the discussion meeting. BASF founder & secretary, Advocate AKM Shihab was played a role as a facilitator of the event. A K M Shihab, delivered an welcome speech at the eve of the discussion meeting. He said the word ‘Syndicalism’ was derived from French syndicate or labor union. The new basis of anarchism is the labor union and the method of action is the labor struggle. This union is not just a tool to fight; the union will be the framework of future society. Based on the 'Mutual Aid', the Unions will contract with each others, they will work in the agricultural field, in the farms, in the mines, they will all productive work together, and our working class will remove the capitalist state. 'Those who do not work, those who do not have any work in the society, they have no place in the society, they will not be in the Worker’s society. Those people who are producing food and cloth, roads and shelters, etc., the society is for them. That is the goal of syndicalism. Socialists have used the unions of the working class for a long time, for occupying the states powers, they have not given their place. Marx and his followers also did not see any role of unions only raising class consciousness among the workers, and in their classless society, they demolition unions with capitalism . We are antagonistic of this principle. Federation of the organizations will be the main power of the regulatory system of the working society. So, the goal of our fight struggle is not to grab any rule, we all want to get rid of all the pedestrians and authoritarianism. We do not want only to remove of exploitation, but want to abolish the rulers. We believe that no human can become a lord of other human. People cannot be human rulers. People will collectively manage themselves by creative actions among themselves. The speakers spoke and express their tribute to the martyrs on the occasion of the great May Day. They urged to strengthen the work of organization and federation in the light of the ideals of anarcho-syndicalism in respect of self-initiatives in order to obtain the equitable rights of all the working people, including all workers, especially the tea workers, rubber workers, construction workers, transport workers etc. Okay ! comrade, thanks for your re-arrangement.